Until the traffic began to back up on August 6, it was just a regular morning commute along 8th St. in smoky Kamloops, grim faced drivers resenting every red light. When traffic stopped they peered angrily about for the cause. It was obvious, a long line of cars taking donations to the SPCA. In the small parking lot stood a transport truck being loaded with food and supplies for animals rescued from the McLure fire. Those hardened, impatient drivers did the unthinkable; they burst into applause, gave the thumbs-up sign and cheered the SPCA and everyone helping. 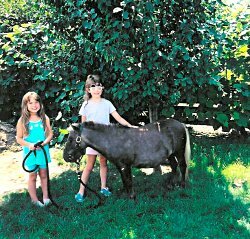 Just one instance of caring in the summer of 2003. 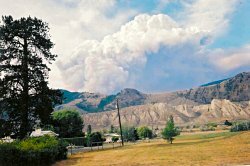 When the McLure, Strawberry Hill and McGillivray Lake wild fires began scorching the North and South Thompson valleys efficient emergency services were set up within hours of the first signs of danger. Volunteers worked round the clock to help ten thousand fire evacuees. But, human evacuees were only part of the problem. Fire in the B.C. Interior is different from fire in a strictly urban location. Kamloops, a city of seventy-eight thousand, is surrounded by rural agricultural, range and forest land. Large ranches, farms and acreages were being evacuated as the fires swept forward. People could be sent to motels or stay with friends, traumatic as that was. 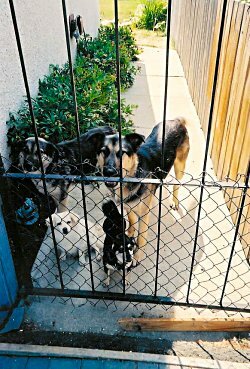 Casey,Cujo, Blaze & Phil, -evacuee dogs. However, domestic pets also needed a safe refuge. And, what could be done with horses, cattle and sheep, some of them scattered over hectares of open range? Stock are a rancher’s livelihood. During the entire fire season people showed great ingenuity, courage and kindness. One fellow who lives and works in Kamloops runs three hundred and fifty head of cattle in Barriere. They were out on the range August 1st when he heard how bad the McLure fire was. Immediately he left to round them up. “No, I don’t know how you can reach him.”, his wife told his boss next day. “I can’t reach him. He’s somewhere near Barriere, on a horse, gathering cattle.” Three days later he called her to say he and his partner had succeeded in getting all the cows to a pasture on the home ranch, where they remain, eating this winter’s hay. Most people in Kamloops have strong personal ties to the smaller communities and ranches surrounded them. They understand a farmer’s priorities. Help came from unexpected sources. Ken, who lives in Kamloops, rushed to Barriere August 1st to help evacuate his brother Bob, Bob’s wife Lisa, their children and animals. The SPCA rescue people had been in that morning to take out four of their horses, two to 108 Mile and two to 100 Mile. Lisa herself had moved the other six horses to Genier Lake, which seemed safe. Most animal refugees were cared for by the SPCA. And, what a job they did! Special constables with the BCSPCA went into fire ravaged areas, day and night, with very sketchy directions, to rescue animals. Small animals were kept at the shelter or fostered out. Large ones, goats, sheep, pigs, horses, and cattle, were brought into the Kamloops Exhibition grounds. That’s where Lisa’s other six horses ended up. Monday, August 4th, Grenier Lake was menaced by fire. She went with SPCA staff to bring all six of them out through the smoke and flames to the KXA. Some of the animals were moved as landowners offered space on pastures not affected by the fires. A small army of volunteers joined the SPCA regulars, including members of Noah’s Wish, a group based in California, which specializes in emergency animal rescue. Directors of Noah’s Wish came to Kamloops from California, Maryland, and New Hampshire. Within a few days six hundred animals had been rescued and were being given free food and shelter. As fires encircled the region the volunteers never faltered in their dedication to helping the animal evacuees. They fed, watered, cleaned stalls, exercised horses. Some local veterinarians donated their time to care for the frightened creatures. In addition to her other duties volunteer Mary Allan even fiddled for the horses as they bedded down each night. She tried them with lively jigs but found they preferred soothing waltzes. The SPCA devotion was matched by support from donors. On August 2nd, one day after the evacuation of the North Thompson, the SPCA put out a plea for materials. When my friend and I arrived at the shelter with our contribution, we found volunteers frantically directing traffic as vehicles pulled up with food, buckets, blankets, kitty litter and toys for the stranded four-footed refugees. One word on the local radio and it seemed the entire city wanted to help. For some ranchers neither the home ranch nor the SPCA were options. Geoff and Shirley Bodman run two hundred head of sheep in the Pinantan valley near Kamloops. They also raise four hundred meat rabbits. When the McLure fire forced evacuation of the North Thompson, Bodmans were there to help their friends on Louis Creek road. On August 8th they loaded up the friend’s sheep, four pigs and nine turkeys and took them to their own farm. “We had the pigs unloaded for about an hour,” says Shirley, “when the order came to evacuate Pinantan because the Strawberry Hill fire was threatening.” They re-loaded their friend’s pigs and turkeys. Then they began dealing with their own animals. “The first call, right after the evacuation notice, was from Arne Raven on the Wolf Ranch at Pritchard offering us pasture for the sheep.” Shirley told me. A neighbour came with a flat deck trailer. Bodman boys from Kamloops arrived home. They loaded four hundred rabbits, four cages high, on the trailer as well as freezers full of rabbit meat intended for the farmer’s market. They put the three domestic cats and a bird in the car, gathered the two hundred plus sheep and began driving them down the road towards the Wolf Ranch. But the road was so busy with other traffic leaving Pinantan they had to drive the sheep through the bush. It began to get dark. They realized they couldn’t continue at night. Friends from Pritchard came with trucks and hauled the sheep to Eddie Hazelwood’s ranch, halfway down the Pemberton range where the rabbits had already been unloaded. The Agriculture Department brought up portable corrals and the sheep and the family settled down. The second night the coyotes came. Bodman’s five Marramer guardian dogs worked till sunrise keeping them away from the flocks. On August 10th the sheep were trucked to pasture on the Wolf Ranch down by the South Thompson River. The rabbits stayed at Hazelwood’s as did the pigs. The turkeys, cats and song bird went to friends in Pritchard. For ten days the Bodman family, including five grandchildren ranging from three and a half to nine years, camped in a tent trailer by their sheep. “Someone had to stay with them.” explains Shirley. “There was an alfalfa field right next to them. We couldn’t risk them getting into it. And we had to water them at the river.” As well, bears came down at night for water. Even a Marramer guard dog can do just so much. On August 10th they were allowed back to Pinantan and the journey began in reverse. There were complications. Two cats, “The two we liked!”,lamented the family, got loose and are still wandering around Pritchard. Some rabbits also saw a chance for escape. A grandson had some success catching them with a net but eight remain running free at Hazelwood’s. Fires seemed to pursue the Bodmans. The family was just getting settled back at home, when yet another fire, the McGillivray Lake fire, threatened Pinantan on August 21st. The Louis Creek pigs, which still hadn’t gotten all the way home, were calm about being loaded into yet another trailer and taken to the KXA. Geoff and Shirley sent their personal effects out to safety, gathered their stock nearby and waited. The power went out as a hydro line near Pritchard was felled by fire. But, the ranch was safe. On August 24th the evacuation order was lifted. Bodmans, their sheep, rabbits and remaining cat were safe for now. But, they’re not bringing their important possessions home until at least October, Shirley insists.